San Antonio Spurs guard Manu Ginobili (20) reacts after a shot during the second half against the Sacramento Kings at the AT&T Center. The Spurs won 112-104. The Big Three rescued the San Antonio Spurs again. After heavy contributions from the Spurs’ reserves and role players to start the season, Parker was jokingly asked if it was about time the Big Three stepped up. "So we’ve been playing bad the whole season. That’s what you’re trying to say? The starting five, we (stink)?" Parker said, playing along. "(The bench has) been playing great; they’ve been giving us a lot of energy." 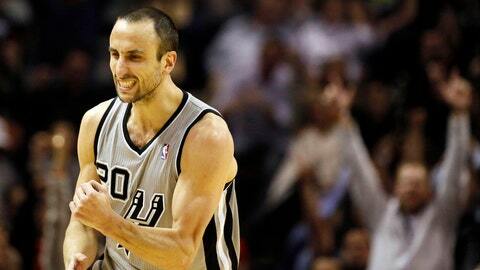 Ginobili, Duncan and Parker scored San Antonio’s final 21 points in a 23-8 run to close the game. "It just showed their experience," Sacramento forward Rudy Gay said. "They’re a great team, that’s the reason their record is like it is year after year. Because they are great, they play great together. They know where they want the ball and they get it there exactly where they want it." "He’s stronger this year than he’s been in several years," Spurs coach Gregg Popovich said. "Both the rest and weightlifting he did all summer. He feels real confident and good about his body. He had two days of rest before tonight’s game and it showed. His legs were great and he was very energetic." "(Cousins) is a tough guy to cover," Popovich said. "He’s so big. But Timmy did a good job to make him work early and making it tough for him to get the shot off. His length helped on DeMarcus down the stretch." Duncan then hit a free throw to complete a three-point play after drawing Cousins’ second foul on the ensuing possession. "We kind of got into a panic and we didn’t execute our game well," Cousins said. "Defensively, we broke down a lot." "We got a little selfish at that point," Gay said. "The ball stuck a little bit, you can’t do that." That wasn’t the case in the third, with the Kings shooting 15 for 24 with Gay and Thomas combining for 27 points in the quarter. NOTES: Kings F Carl Landry remains out with a torn left hip flexor muscle. Landry has not played this season. . The mascots for the Texas Longhorns and Oregon Ducks appeared in a skit during the first quarter to promote Monday’s Valero Alamo Bowl at the Alamodome, former home to the Spurs. … Popovich was teased about his wardrobe selection, wearing a black jacket with a white checkered pattern. Spurs television analyst and former player Sean Elliott attempted to play tic-tac-toe on the jacket when Popovich appeared on the local coverage.